We grill up lots of burgers over the summer and we usually pair our veggie burgers with grilled corn, a fruit salad or a big leafy green salad but for me nothing beats a burger and fries. I love these lightly seasoned dill infused french fries. They have a hint of dill and a classic tangy and salty pickle taste. A perfect side for your favorite summer burger. Preheat oven to recommended packaging instructions. In a large mixing bowl whisk together vinegar, garlic powder, dill and pepper. Add in the frozen fries and toss to coat. 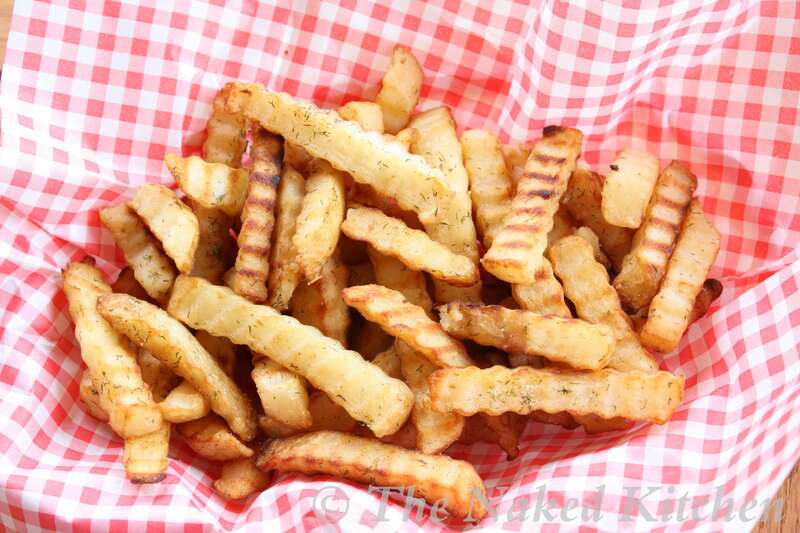 Spread the french fries on a baking sheet and bake for recommended cooking time, flipping the fries over once during cooking. Remove from the oven and sprinkle with sea salt. Makes 4-6 servings depending on the variety of french fry. This dish is best when eaten right away. If you prefer a more intense dill flavor you can add an additional 1 tsp of dill to the vinegar mixture.